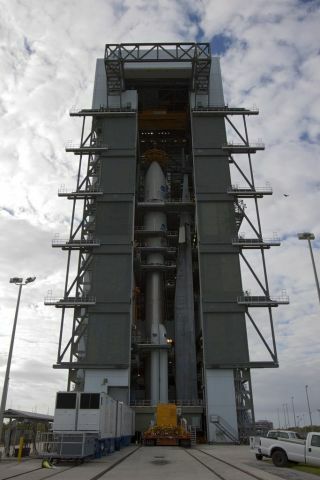 NASA's Curiosity Mars rover was hoisted atop its Atlas 5 rocket on Nov. 3, 2011. NASA has pushed back the launch of a $2.5 billion Mars rover by one day, to Saturday (Nov. 26), in order to replace a suspect battery on the rover's rocket. "The launch is rescheduled for Saturday, Nov. 26 from Space Launch Complex-41 at Cape Canaveral Air Force Station, Fla.," NASA officials wrote in an update. "The one hour and 43 minute launch window opens at 10:02 a.m. EST." The launch will blast off atop an unmanned Atlas 5 rocket to send the rover, called the Mars Science Laboratory Curiosity, toward the Red Planet. The one-day launch delay will allow engineers to replace a suspect battery in the rocket's flight termination system — an emergency safety system used to destroy the Atlas 5 rocket should it veer off course after liftoff. NASA has until Dec. 18 to launch the new rover toward Mars and still make the current flight window to the Red Planet. The car-size Curiosity rover carries 10 instruments and is designed to seek out any evidence that Mars was once habitable or could support microbial life in the past. The rover also has a laser to shoot rocks in order to study the gasses released from them and beam the observations home to Earth. The Curiosity rover is NASA's largest Mars rover mission yet and is expected to last at least two years exploring the Martian surface. Curiosity is about 9 feet (3 meters) long and wide, and has a camera mast that stands about 7 feet (2.1 m) tall. The rover is also equipped with a sophisticated robotic arm that has a reach of up to 7 feet. Each of the rovers wheels are 20 inches (0.5 m) wide. The rover carries a nuclear power source to feed its onboard systems instead of the solar arrays used by its wheeled predecessors on Mars: the rovers Spirit, Opportunity and the smaller Sojourner. It is also designed to land on Mars using a rocket-powered sky crane, which will lower the rover to the Martian surface. If all goes well, Curiosity is expected to land inside Mars' huge Gale Crater sometime on Aug. 6, 2012.